To reap the benefits of your long distance training, you need to consume healthy foods so you can properly fuel your body, build muscle & recover from hard & long workouts. As you get progress through your training for your race, you will find that what you eat impacts how feel both during and after your workouts and ultimately how long it takes you to complete your race. Also, to get prepared for your race, you must stay healthy while you train. This means you need to build a strong immune system. It’s easy to get tired and even run down during your training if you don’t properly recover. In this post I will speak to the importance of diet during your training. I will also provide some sample meals. Although, exercise helps build the number of germ fighting cells in your body, eating the right foods also helps. 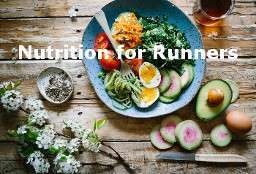 Healthy runners have a diet that includes a balanced diet of carbohydrates, protein, lean fats, vitamins and minerals such as zinc, iron and vitamins C & E for a strong immune system. It’s important to eat nutrient-dense calories & drink plenty of water prior to your main workout of the day. Also, to limit post exercise muscle damage and speed the recovery process you need to consume both protein & carbohydrates soon after your runs. This is especially important in the 30 – 45 minutes following a hard run and then a few hours later to have a bigger meal. This helps to ensure optimal recovery. Just like each person’s training is different because of their goals, mileage and athletic abilities, the same is for nutrition. Each runner’s body can responds differently to foods. It’s important that you try different healthy foods and time consumption so you can optimize your performance and avoid any GI issues. Here’s some proven strategies that I follow & share with runners I coach. Avoid empty calories and focus on eating foods that give me the most nutrients per calorie. These include good sources of whole grains and starches (like brown rice, quinoa, sweet potatoes, oatmeal, whole wheat bread and pasta), lean proteins (lean meat, fish, Greek yogurt, eggs and beans), healthy fats (salmon, avocados, nuts, and olive oil), and of course, colorful fruits and veggies which provide antioxidants, vitamins, and minerals. Avoid processed foods. A good place to start is to cut back on food that comes from a plastic wrapper. If you must purchase packaged food, then choose those with the fewest and most familiar ingredients. Or Baked Salmon + baked sweet or russet potato with nonfat Greek Yogurt & Brummel & Brown Yogurt butter. The bottomline for your diet is that just like with your training, there are no shortcuts or 3-4 foods you can consume that will make-up for not eating a well balanced diet. You don’t have to be too strict, just be aware of what & when you eat and listen to how your body reacts. On the day of the race, never eat anything that you haven’t previously tested during your training. Following are my workouts for the week of June 11th. The purpose of this run was to recover from the previous days’ long run. It’s very important to go easy throughout this run, especially considering the next days’ workout is going to be tough. This was a tough workout. 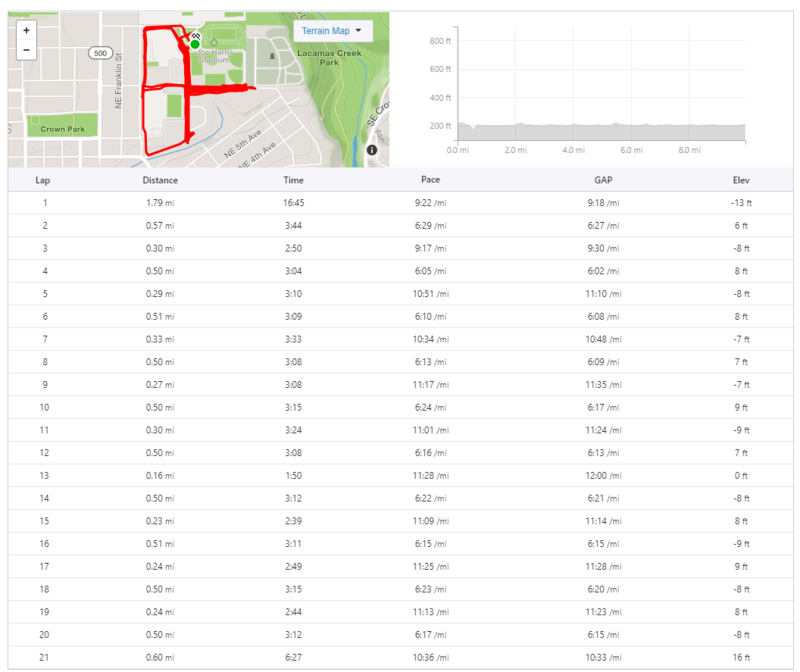 I couldn’t run on the High School track, so I just ran on neighborhood surface streets near the track (not optimal). I was tired the last 3-4, but I pushed through. 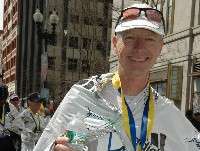 My times weren’t near target (3:05-3:16), but the stimulus of the workout achieved it’s goal. 5 mile easy run + strides. The purpose of this run was to recover from the previous days’ very demanding run. The purpose of today’s workout was to build strength. 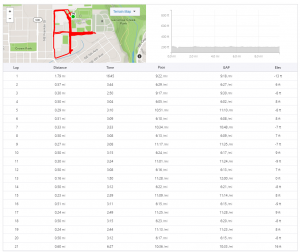 I increased the distance by a mile from my last tempo. Paces are the same, as shown in the image below. After a 1 mile warm-up, I complete 9 miles at marathon pace. As you can see, I was right on pace for the duration of the tempo. The extra day of rest (completing this workout on Friday instead of Thursday as my scheduled called out) really helped. I’m happy with this run, especially after struggling through the Yasso 800s on Tuesday. The purpose of this run was to recover from the previous days’ intense workout. The conditioning exercises weren’t too intense, but they help to build strength & improve flexibility. A slightly longer run than typical easy days, but at an easy pace. As we get closer to the race, I am shortening some of my runs.